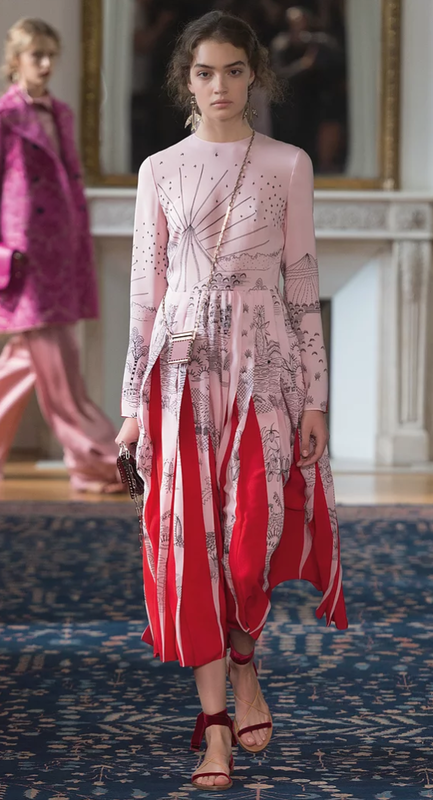 ^ LOOK 44 by Pierpaolo Piccioli for his 1st solo VALENTINO Collection Spring 2017. My most favorite designers of recent years were the duo behind VALENTINO. Now, Pierpaolo Piccioli, is the solo Creative Director of Valentino. His longtime partner, Maria Grazia Chiuri, left to be the first woman Creative Director at Christian Dior. I'm very excited to see what she does there. For his debut collection, Pierpaolo approached Zandra Rhodes to collaborate with him on a series of prints. Zandra is an English fashion designer probably most famous for her dramatic pink hair, but also for her colorful, hand-drawn textiles and glamorous 1970's dresses. She calls her work: "wearable dreams." 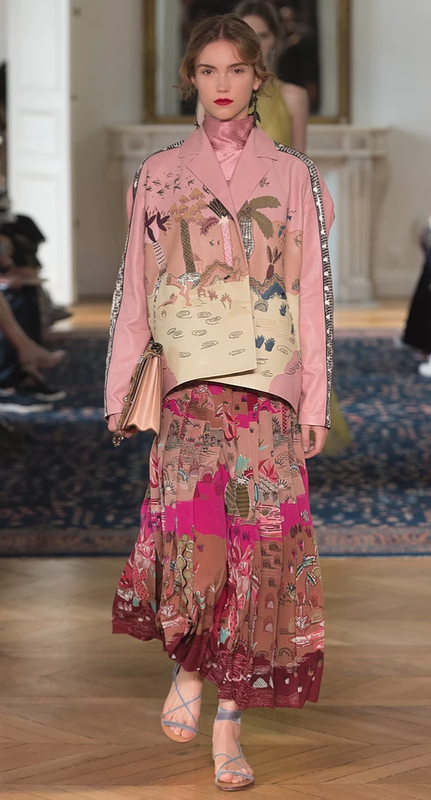 For the Spring/Summer 2017 Valentino collection (some examples below), Pierpaolo wanted a mash-up of the painting, 'The Garden of Earthly Delights' by medieval painter, Hieronymus Bosch, and Zandra Rhodes' current and archived prints. When I heard that Pierpaolo and Zandra were working together I knew the result would be fabulously chic. The renaissance-inspired silhouettes from Pierpaolo mixed with the wild, edgy, pixie-esque world of Zandra? ....Yes, please. When I was in my third year in the fashion program at Rhode Island School of Design, I decided to move to London for the summer and study at Central St. Martins. I chose courses on Shoe Design, Art Direction, and Fashion Journalism. I didn't know anyone and mainly spent my days wandering the vintage markets and sitting on the floors of museums sketching. One of those was the Fashion and Textile Museum, which was founded by Zandra Rhodes. 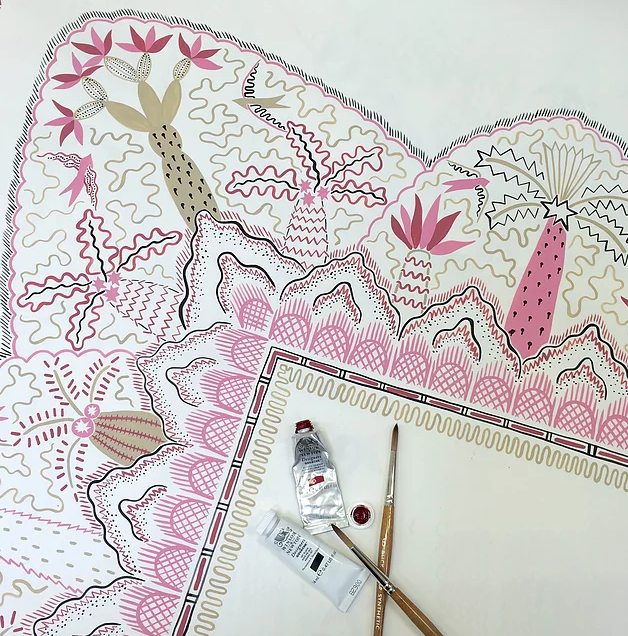 It is "dedicated to showing the work of fashion and textile designers from the 1950s onwards...Zandra’s very own “Zandra Rhodes: A Lifelong Love Affair with Textiles”, is a major monographic exhibition which explores her forty year career." I spent 2-3 hours looking at every piece and marveling over the details, embroidery and color play. I felt an affinity for her love of travel and other cultures and honestly was buzzing with stimulated thoughts and ideas for days. I am gratified to see her work getting new attention and much deserved recognition for the part it played in fashion history.